When we measure temperature what we’re really measuring is energy being released by moving molecules. To make a soothing cup of tea, we take some water and put it over a source of heat, like an electric element or a gas stove. As the heat enters the water, it makes the water molecules move faster and faster. These molecules absorb the energy from the heat and convert it to movement energy also known as kinetic energy. The opposite can happen also. When molecules slow down, their kinetic (movement) energy decreases and some of which is released as heat. The faster a molecule is moving, the more heat energy it has available for release. The slower a molecule is moving, the less heat energy it has for release. If we turn off the air conditioning in our home the heat outside our house slowly enters inside, making our house warmer and warmer. We would love for our home to remain cool and comfortable without air conditioning but the second law of thermodynamics declares that heat flows from hot areas to cool areas and it keeps doing that until both areas are more or less of equal temperature. The summer heat outside of our house continues to enter our home until the inside of our house is nearly the same temperature as the outside of the house. Sometimes, on blistering hot days, we would love to go to a magical place where there’s no heat and we can chill effortlessly. But that’s just wishful thinking right? Actually, there is such a place with very little heat. And it’s out of this world! It is, in fact, literally out of this world, as in outer space. There are very few moving atoms in many parts of outer space making it close to zero-heat cold. Since we don’t want to die from a lack of oxygen or freeze to death from a lack of heat we’re not going to be moving our sofas and TVs into outer space anytime soon. Still, it would be a cool place to visit, aside from the suffocation. What if we wanted to create a zero-heat space on good old Earth, how would we do it? For centuries scientists pondered this question. They wondered if it was possible to create an absolutely cold, no heat releasing substance. And if it were possible to create such a substance, with perfectly still molecules, what would the temperature of such a substance be? In 1848 a fellow named William Thompson (aka Lord Kelvin) hypothesized the coldest possible temperature in the universe was -273.15°C . He called this temperature absolute zero. 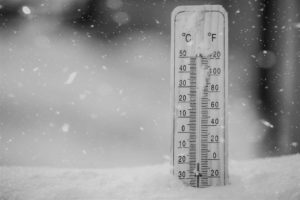 Once Lord Kelvin publicized the idea of absolute zero, it sparked a scientific race to see who could slow down the atoms in hydrogen gas or helium gas to reach the magical no heat temperature of absolute zero, -273.15 on the Celcius scale or zero degrees on the kelvin temperature scale. After centuries of effort and millions of dollars the theoretical temperature of zero degrees kelvin has never been achieved, although a good scientific lab today can come within a billionths of a degree of absolute zero. However, it requires a lot of expensive coolants and complex lab equipment and even still the near absolute zero temperature doesn’t last very long. It exists only for a brief, fleeting fraction of a second. We now know that absolute zero temperature does not equal absolute atomic stillness. Atoms can emit zero heat but remain extremely active on the quantum level. It’s just that they are emitting net zero heat. It’s like when we get a paycheck at the start of the month and we use it to pay all the household expenses, clothing, food, rent, utilities, and by the time we’re done all the money is used up. We did a lot, there was a lot of financial activity in our home, but somehow we still ended up with net zero dollars added to our bank account at the end of the month. It’s as if that money we got at the beginning of the month never existed. The same thing is happening with molecules with a temperature of absolute zero. At the subatomic level there’s lots of quantum activity but no net heat. Just as scientists have spent centuries pursuing the elusive molecular stillness of absolute zero, so too have meditaters spent centuries pursuing the elusive absolute stillness of zero thoughts. And just like the pursuit for stilling the molecules of gases to reach absolute zero involved progressively colder and colder temperatures, ancient meditation scriptures describe the progressively stiller and stiller levels of thinking in pursuit of absolute stillness. The various nirvana and samadhi levels detailed in meditation lore require varying levels of time and effort to attain. Only a rare group of scientists have ever witnessed the coldest of cold temperatures on earth and only a rare group of meditators have experienced the stillest of still minds. And just as there is no real absolute stillness of atoms there is no real absolute stillness of mental activity. Even monks meditating diligently for years or yogis sitting silently in caves for decades, still require some mental activity to maintain the quieting of thoughts and the functioning of their body. Their quietude is brief and fleeting. Perhaps an absolute and complete cessation of thoughts exists but most likely it occurs once we’ve breathed our last breath and thought our last thought. But this doesn’t mean the pursuit of absolute mental stillness during our earthly existence is pointless. The time and effort spent chasing an absolute zero temperature on Earth led to the development of useful coolants allowing humanity to cool everything from machinery to food to human body parts. The pursuit of a zero heat emitting substance led to a major improvement of our lifestyles and extensions of our lifetimes. Similarly the search for absolute stillness during meditation can lead to an improvement of our lifestyle (who doesn’t want to worry less?) and an extension of our life achievement (clearer thinking leads to clearer results). Mind elevators don’t fixate on on the end result of zero thoughts. They just go about slowly, gently, compassionately quieting their minds, even though it may be elusive or even unachievable. They aim to remain cool when the heat is on and to draw on the calm and joy, insight and stillness they preserved while sitting on the meditation cushion.